Today, the Human Rights Campaign (HRC) Foundation and the Equality Federation Institute released their annual State Equality Index (SEI), a comprehensive state-by-state report detailing statewide laws and policies that affect LGBTQ people and their families and placing states in one of four categories based on their pro- and anti-LGBTQ state laws. This year’s SEI details the onslaught of more than 125 anti-LGBTQ laws introduced across 30 states during the 2017 state legislative season, including legislative proposals to grant sweeping licenses to discriminate; undercut marriage equality; and target the transgender community -- including transgender children. The report comes as more than 40 state legislatures will reconvene by the end of January. A new 2018 legislative preview report from HRC also found that state legislators, under relentless pressure from opponents of equality, are expected to wage attacks on transgender people -- particularly in the critical areas of health care and access to appropriate restrooms. The 2017 SEI report points to a few encouraging signs for LGBTQ youth, as well as transgender and gender non-conforming people seeking to update their identity documents. Four states -- Connecticut, New Mexico, Rhode Island and Nevada -- passed new bans on the practice of so-called “conversion therapy,” bringing the total number of states with such bans to 10, plus the District of Columbia. And the number of states in the SEI’s highest-rated category, “Working Toward Innovative Equality,” increased this year from nine to 13. These states and the nation’s capital of Washington, D.C. have robust LGBTQ non-discrimination laws covering employment, housing and public accommodations, as well as protections in the areas of credit and insurance. Despite these wins, laws protecting LGBTQ people from discrimination vary widely across the nation -- or simply do not exist in many states. Even at a time of historically broad and deep support for full LGBTQ equality, an estimated 12 million-plus LGBTQ Americans and their families remain at risk, particularly if they live in one of the 31 states where laws do not adequately protect them against being fired, evicted or denied services because of their sexual orientation or gender identity. A map of this patchwork of protections can be found here. According to new HRC polling data, collected by Hart Research Associates, a strong majority of likely voters nationwide support laws that would prevent discrimination against LGBTQ people in the workplace (59 percent) and in housing (58 percent) -- such as the federal Equality Act, which was reintroduced in Congress earlier this year. In fact, many voters believe these protections already exist: fully thirty-eight percent of voters interviewed in a new HRC poll incorrectly believed that current federal law fully protects the right of LGBTQ people on matters such as employment, housing and access to government benefits. 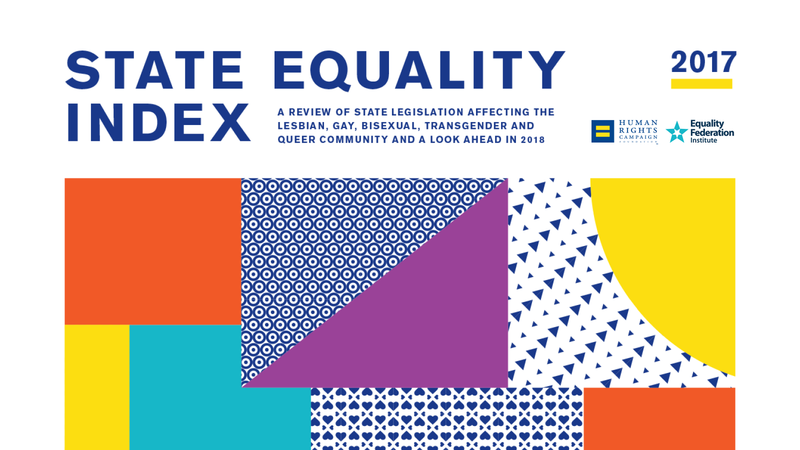 HRC’s full State Equality Index report, including detailed scorecards for every state; a comprehensive review of 2017 state legislation; and a preview of the 2018 state legislative session is available online at www.hrc.org/sei.